This goes great with sandwiches or cold cuts. 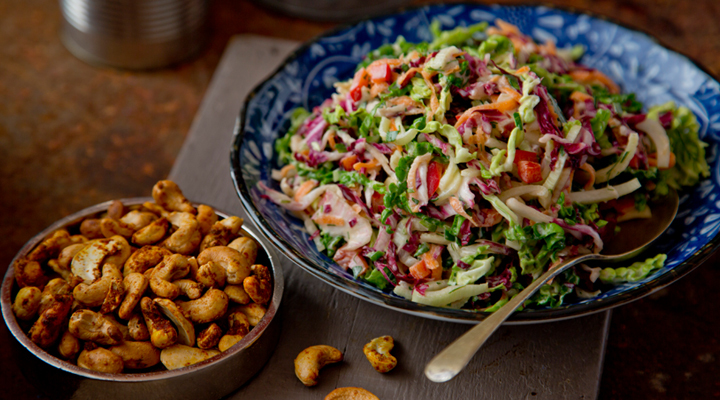 You can make loads of the spiced nuts and use them as a party snack too. 1. Mix the carrots, fennel and 2 tablespoons of the lemon juice in a large bowl. Set aside for 20 minutes, then transfer to a sieve set over the sink and leave to drain. 2. Preheat the oven to 160°C/gas mark 3. 3. For the spiced nuts, place the cashews, paprika, turmeric, cumin, sugar and salt in a small bowl. Stir through 1 tablespoon of water so the spices cling to the nuts, then place on a baking tray in an even layer and roast in the oven for 10 to 12 minutes, until golden and crunchy. Set aside to cool. 4. Return the strained carrots and fennel to the large bowl along with the cabbage, radicchio, red pepper and chilli. Stir well. 5. Whisk together the yogurt and mayonnaise with the remaining 2 tablespoons of lemon juice and the olive oil, mustard, honey and a pinch of salt and white pepper. Pour this over the vegetables and mix well. Add the fresh herbs and spiced nuts, stir to combine and transfer to a serving bowl.